Location: Stranorlar in County Donegal, Ireland. Notes: Drumboe Castle is located near Stranorlar in County Donegal, Ireland. 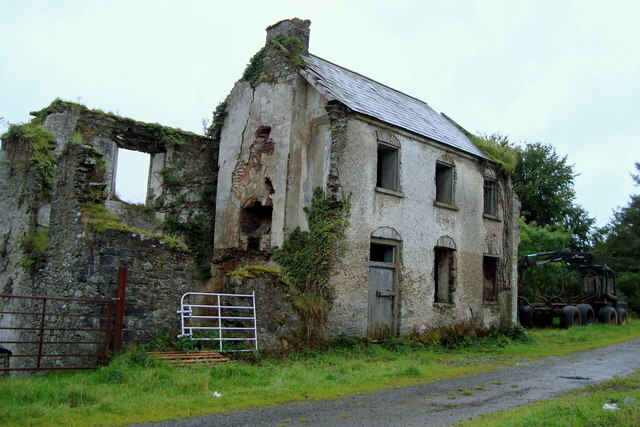 In 1622, Robert Redington sold the estate at Ballybofey to Sir Ralph Bingley. Bingley erected the original Drumboe Castle, which had four large towers. Its location protected a ford across the river. After the death of Sir Ralph Bingley, his widow Lady Jane and Robert Harrington took charge until 1641, when it was granted to Sir William Bazil, Attorney-General for Ireland. He died in 1693. A descendent of Sir William Bazil was William Basil (who was born William Ball and changed name to Basil). Basil married Frances Dowdeswell around 1736. Their daughter Mary Basil married Sir Samuel Hayes, 1st Baronet and through this marriage it became the home of the Hayes baronets, of Drumboe Castle from 1789 to 1912. The Georgian house was demolished in 1945.